There is a dedicated UI for importing DSV (CSV and TSV) files to the database. 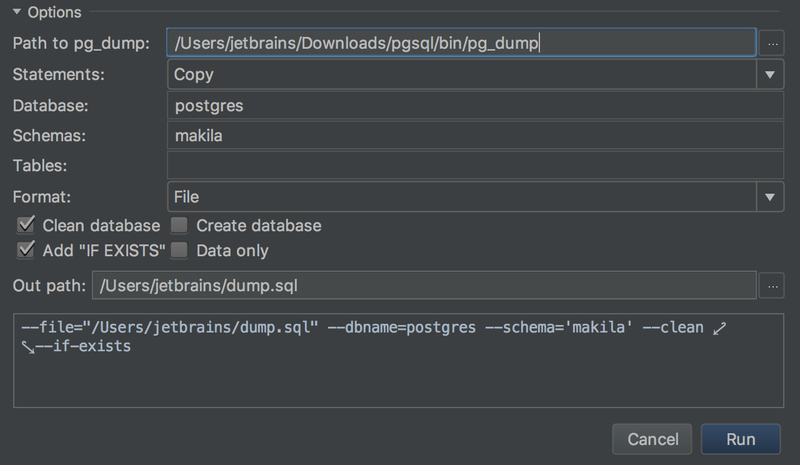 Click the schema you wish to import data to, and choose Import From File… from the context menu. Then select the CSV file where your data is stored. You will see the Import dialog window. The left-hand panel is for format specification: choose the delimiter, if the first row is the header (the separate format options are available for it), and specify if you have quoted values in the file. What happens if there are errors in the file? A write error records to file option is available. The import process will not be interrupted, but all the wrong lines will be recorded in this file. Paste data from Excel tables. Generally to do this, you need the ability to paste data in a DSV format. In DataGrip you can define any format you want, or you can let the IDE detect the format automatically: Gear icon → Paste format. 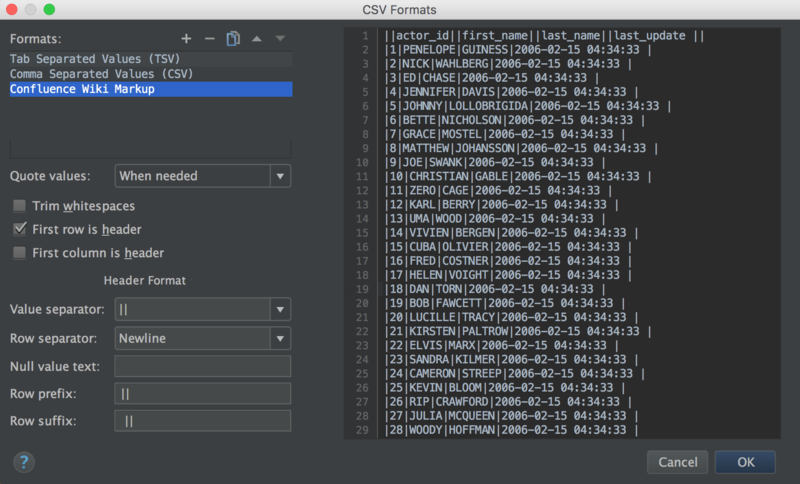 DataGrip can edit CSV files as tables. Click on Edit As Table in the context menu. Then choose the delimiter, specify if the table has a header, and when to quote values, etc. An instant table preview is available. — File. 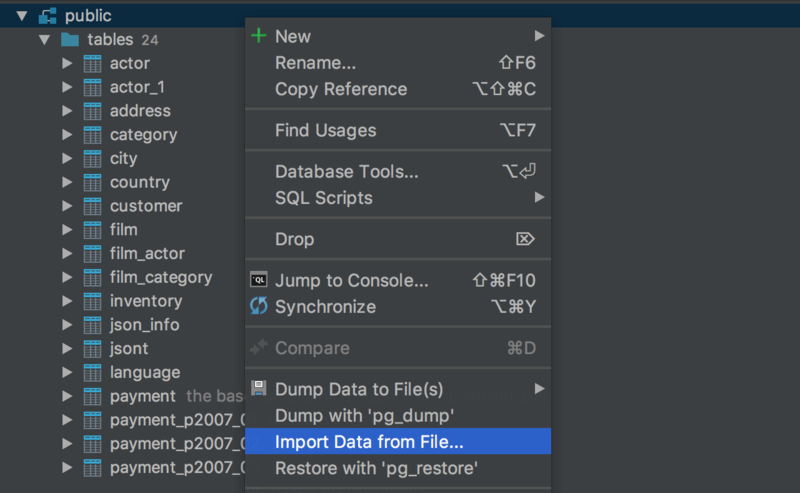 Context menu of a table → Dump data to file. — Another existing table. Context menu of a table → Copy Table to (or just F5 on a table) → Choose existing table. — New table in any data source of any database vendor. Context menu of a table → Copy Table to (or just F5 on a table) → Choose target schema. Or just drag-n-drop it there! This gif illustrates how a PostgreSQL table can be copied to a SQLite data source. 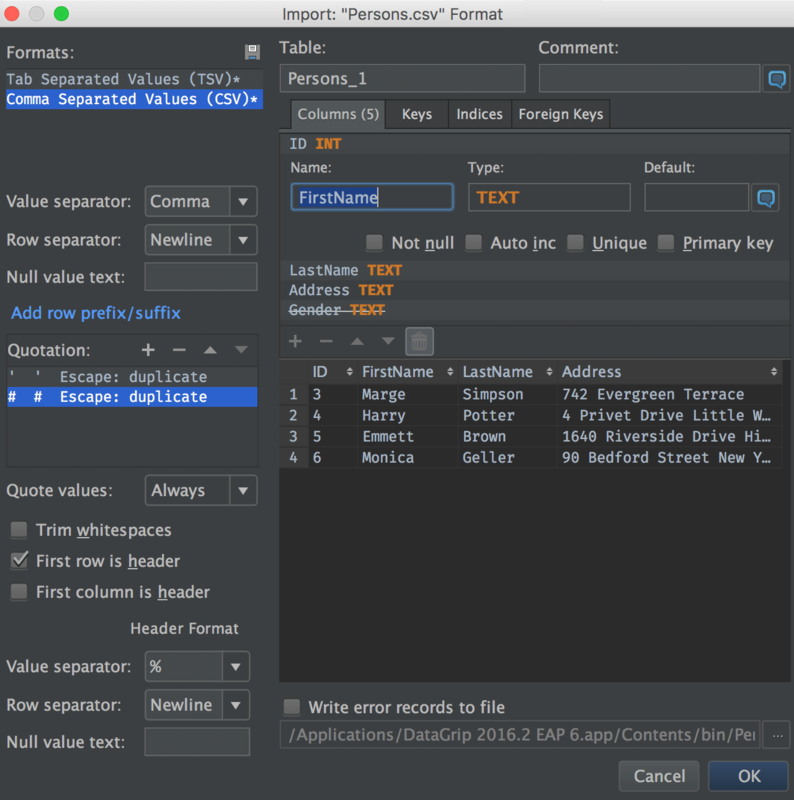 SQL query can be exported to a file as a result. Context menu on a statement → Execute to file (or just F5 on a table) → Choose the format. It is useful if the query is slow, if you export the result-set, the query will run again. In this case you run it only once. — File. Dump button → To File. — Clipboard. Dump button → To Clipboard. — Another existing table. 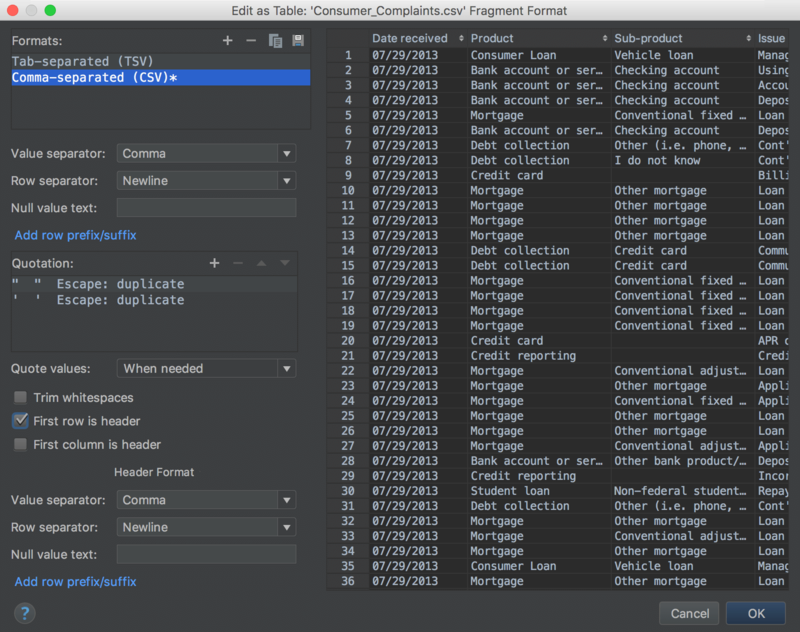 Export button → Choose existing table. — New table in any data source of any database vendor. Export button → Choose target schema. 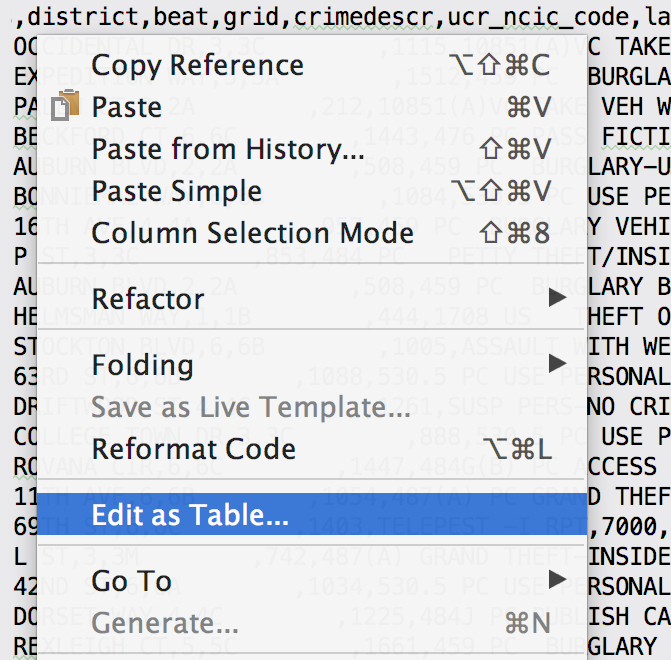 A selection in the data editor can be copied to the clipboard: as usual it’s done with, Context menu → Copy or Ctrl+C. Every time you export to a file or to the clipboard, you need to choose a format. Usually, it is CSV, but in many cases you need JSON, XML or even DML statements. Choose the appropriate Data Extractor from the drop-down list. Or create your own export format. Any table or result-set can be presented as a batch of INSERT statements. To do this, choose SQL Inserts from the drop-down list. In some situations it can be faster than writing a INSERT+SELECT query for adding data to another table. This generation is aware of auto increment IDs. It can be also can be also presented as a batch of UPDATE statements, which can help you to modify data. There are two pre-built formats in the list: Comma Separated Values and Tab Separated Values. You can create any custom format based on DSV. For instance, it can be Confluence Wiki Markup. There is one pre-built extractor you cannot change: HTML table. There are also scripted extractors: HTML-Groovy.html.groovy, XML-Groovy.xml.groovy and others. You can modify these extractors. 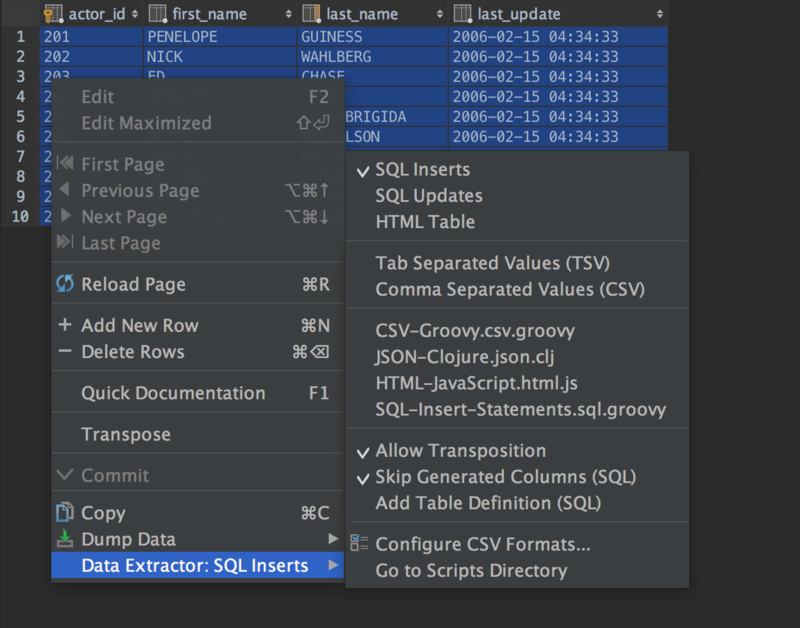 JSON-Groovy.json.groovy extractor will export your table or result-set to JSON. For more complicated cases, consider using scripting extractors. Several of them are already available such as CSV-Groovy.csv.groovy, HTML-Groove.html.groovy, and others. Select Go to scripts directory in the extractor menu to navigate to the folder where they are stored. To learn more about creating extractors, please, read this tutorial.